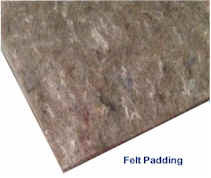 This type of pad is most common in the residential setting. It is made from recycled materials, mainly from recycled urethane foam and is multicolored. It is available everywhere, and in almost every thickness and density. It does a good job supporting your carpet and is reasonable priced. This is the most economical choice for your home, rental or office. 6 to 10 pound density is common. I prefer at least 8-pound density for residential homes and especially on stairs. 8-pound gives excellent support for homes with active kids too. Not all rebond padding is of high grade or top quality. Every padding manufacturer offers several grades of rebond padding to their distributors. 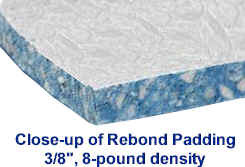 Retailers have a choice of which grade of rebond padding to offer to their customers. The main difference will be the type of recycled materials used to manufacture the padding and the density rating. The higher the quality of recycled materials used, the better the rebond pad will perform. Reputable carpet dealers always offer top quality rebond padding to their customers. The price you pay for a good quality padding may be slightly higher than at the shady discount carpet store down the street, however you should never skimp when it comes to buying a good quality padding to go underneath your good quality carpet. This type of pad is often very inexpensive and lightweight. If a retail store tries to give you free pad with your carpet purchase, this is usually what they plan to give you. This type of padding will not tolerate much traffic. It will soon become completely flat as a pancake after a year or so and is not a good choice for a residential setting. This is often used in apartment settings where the carpet life span is less than 3 years. 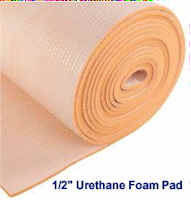 Not made from recycled materials, this type of pad is called prime or virgin urethane. It's a better grade of foam pad (frothed foam) that could be a good choice for the home. It is made of very dense urethane (polyurethane). It is designed primarily for commercial applications, but is becoming more common in residential applications. The cost is more than a standard Rebond and not a common choice among homeowners. These types of natural wool or synthetic pads are used primarily for Berbers and commercial carpets. They are very dense, breathe well, and are not spongy at all. They are made from recycled or shredded fabrics or natural wool. They are designed to support and allow looped Berbers and commercial carpets to wear well in heavy traffic situations, and to prevent these types of carpets from stretching out and developing wrinkles. I seldom recommend using a rubber waffle pad in residential applications. Rebond pad is a much more economical choice and it does a great job at supporting your carpet as long the correct thickness and density is selected. Rubber slab padding is often used in commercial applications over concrete. Rubber padding density is usually rated in ounces instead or pounds. Some carpet salespeople may try to convince you to upgrade your order with a specialty pad that has claims of being able to eliminate odors or have a moisture barrier surface that will help with pet accidents. I don't generally recommend these type of pads and suggest you avoid the extra expense. I believe it will just cost you more money and not solve or diminish your pet accident problems. If you have a pet urine / accident problem there is no padding on the market today that I know of, that will solve your problem. Spending more money on a specialty pad will likely not reduce the severity of your pet accident problem. Sorry! Don't assume a specialty pad will solve your moisture problems! If you have a moisture problem with your concrete slab or in your basement, installing a moisture barrier padding will not protect you from the dangers of mold and mildew. Don't be fooled into thinking that spending more money on a specialty pad will solve your moisture problems, it just doesn't work that way. You need to address your moisture problems first and then select a good quality pad that is designed to properly support your carpet and meet your needs and goals. What do I consider to be a Specialty Padding? Tempted to buy a padding they say will extend your carpet warranty? Are You Wondering... How Much Does Carpet Cost?